Cockatiels are native to Australia, where they are found largely in arid or semi-arid country, but always close to water. Largely nomadic, the species will move to where food and water is available. 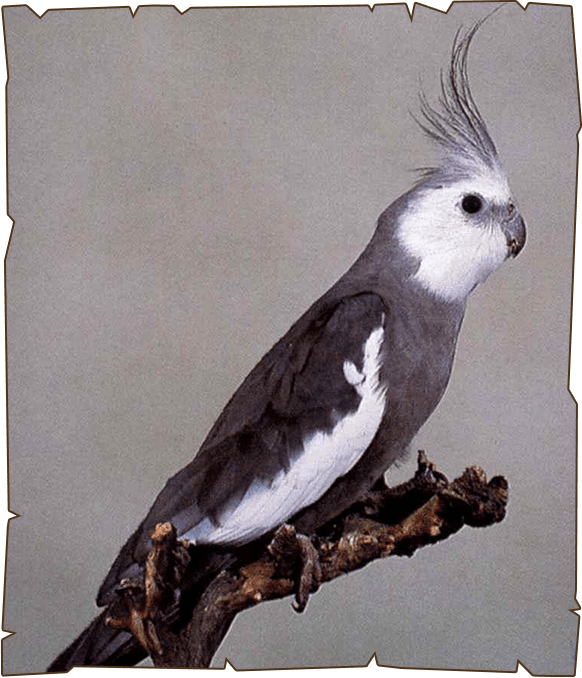 The cockatiel`s lifespan in captivity is generally given as 16 to 25 years. These birds get up to 12 inches (30 cm) and weigh 3 to 4 ounces. Bird food consists of a variety of sprouts, seeds, nuts, fruits, vegetables, and commercial pellets. Cockatiel breeding can be a very rewarding experience. Cockatiels will readily nest provided they have a nest box and some material to construct the nest from. They lay one egg every other day until they have laid about 5 eggs. The incubation period is 17 - 22 days. After hatching the young birds will open their eyes at 9 days of age. Cockatiels are relatively vocal birds, the calls of the male being more varied than that of the female. Cockatiels can also be taught to sing specific melodies. Much like parrots, but not quite to that extent, Cockatiels can be taught to repeat words spoken by human owners.